Due to the late melting of our snow slide, the ground park will open at reduced capacity from April 19th to 22nd. The unlimited packages are ideal if you come see us and you have enough time. 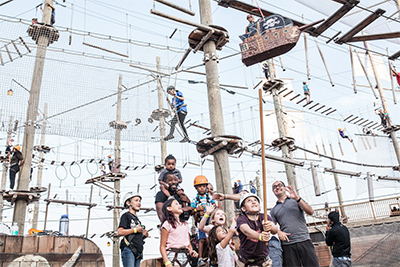 With unlimited package, you can use the 2 hours as you wish, which means that you can switch between the inflatable games, climbing, aerial courses and all aboard courses. You can make 5 times the same course or try 5 different courses. Details of the different tickets in the "Packages" section below. We ask that you arrive on time for your reservation to the extent possible. However, be aware that your time only starts once your entire group has received equipment and instructions. To easily change your reservation without penalties, click here: Changing a reservation. Access to all aerial courses and ground activities up to 4 hours. Allows you to make the whole park without being pressed in time. Access to all aerial courses and ground activities until 2 hours. Allows you to do about half the aerial park. Access only to inflatable games and the carousel for 1 hour. No reservations required and no online purchase. The annual pass gives you access to all the games in the park! 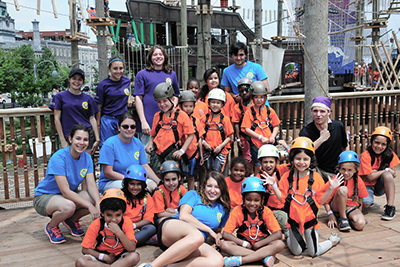 We offer combos with other activities in the Old Port of Montreal. Make sure to combine the activities and save some money! 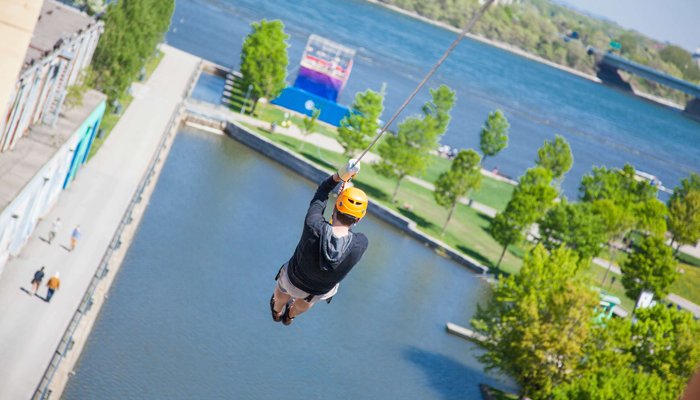 Montreal Zipline offers a safe and unique zip-line experience. It’s course offers a breath taking view of the city and the St-Laurent river. 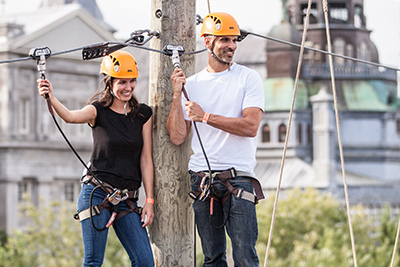 Montreal Zipline is a must for the whole family ! 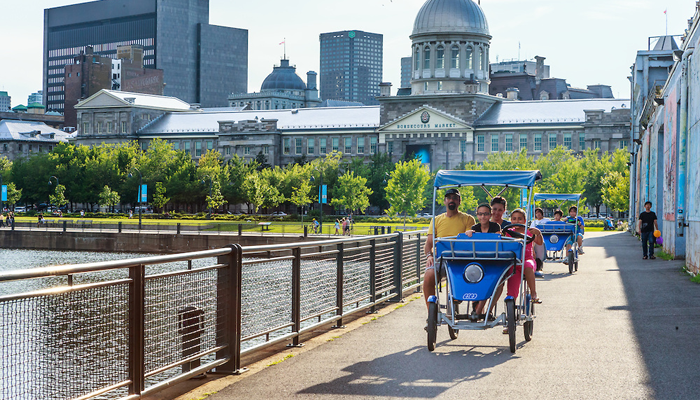 Hop on one of our 3 or 6 places Quadricycles and pedal to move around the docks of the Old Port of Montreal . While trying to maneuver your vehicle to make your way among pedestrians, laughs are guaranteed! A really pleasant way to discover all the surprises that abound in the docks ! Discover the Old Port of Montreal in a new way: hop on one of our paddle boats and explore the nooks of the Bonsecours Basin. 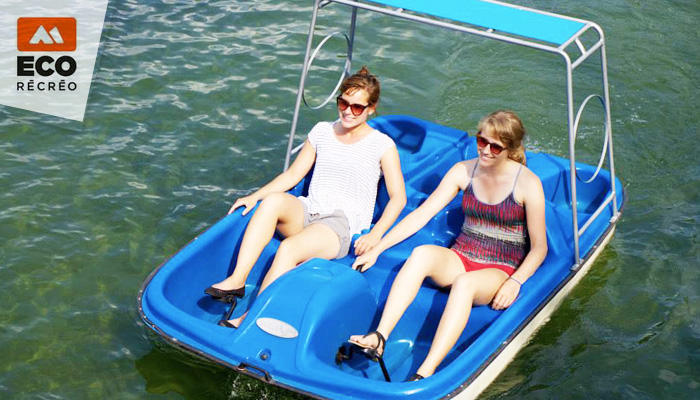 Stretch your legs and enjoy the sun or roam great distances ; you are the captain of your boat ! To find out more about Voiles en Voiles group packages, click on the image below. Can you be 3 children and 1 adult for a family package? Yes, there should only be at least 1 adult and 1 children among the lot. Is it possible to buy gift certificates? Yes, you can do it online by selecting "offer" in the online booking system. Is it necessary to reserve? No, but it is strongly advised. You can buy your tickets and reserve the time and date of your visit directly in the online booking system. As for the kids birthday parties and the groups of more than 20 persons, reservation is mandatory. So, will you a member of the royal guard or an evil pirate?